Nice, clear, beautiful graphics. You can choose the country which you want to play for. Has a commentator, nice music. But - this is not the solitarie I prefer. 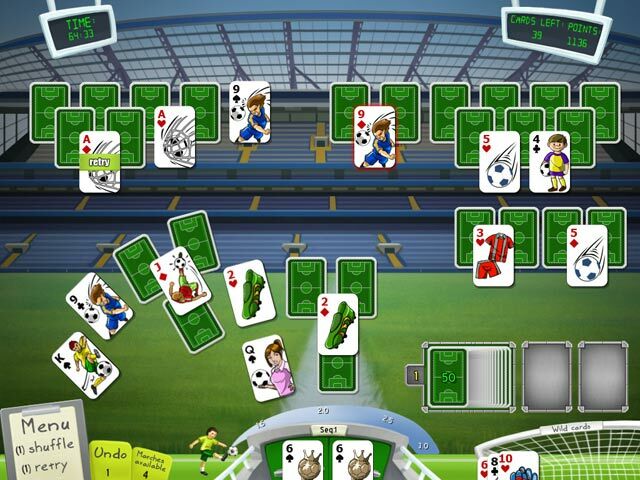 I played 15-20 minutes of this game - but in this solitaire game you just find 2 cards with the identical number. Will be a great game for those who like this type. I just prefer to actually 'think and figure out' like with Fairway Golf and Fairway. A good relaxing game, it`s a match game, you must match a pair of cards such as 2 of the number 3, 2 of the number 4, etc. The object of the game is to beat other countries in soccer. You will pick your country and then square off with 3 other countries who are competing with each other for a final grudge match with you. You will obtain a goal after 45,000 pts. (which is very easy to obtain). You get points for the same suit, such as diamonds, hearts, etc. You also will get points for the same color, such as black or reds. You get points for following a sequence as a pair of twos then a pair of threes then a pair of fours ,etc. You will also get points for when you match a pair of threes (or whatever pairs) and then match another pair of the same ones such as 2 or 3 or more sets of the same pairs. Each level it deals out a hand and you must match them, either from the deck or on the board, and that is how you obtain the points, there is a place where you can place cards that you can`t use, there is retry and shuffle and undos. Also there is 2 competetion carde, one is a special event card and that allows you to either get another goal or other things, such as losing a wild card or getting one, etc. 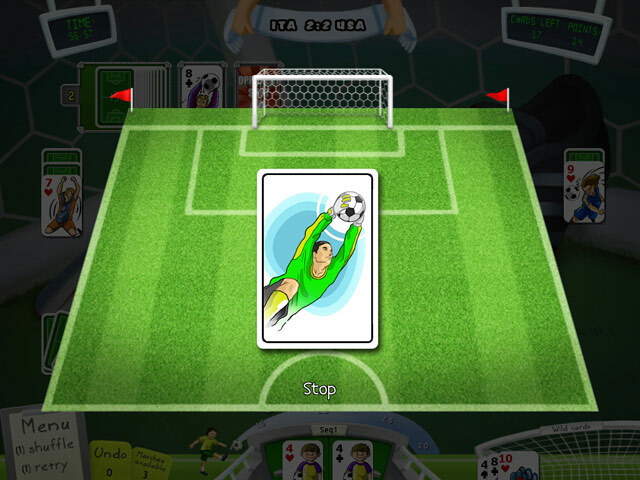 The other special card is for the other team to kick a goal and there is two cards for that one, you either stop the ball or don`t which gives them a goal. I just played the demo and got hooked so I bought it, I don`t know if you get any points for using all the cards in the deck as I just cleared the board (which you will get points for a perfect game) I don`t play with sound in any games as I find it too distracting. The graphics are very clear and cards are also clear, and as I said before the game is very relaxing, the only challenge is to make as many pairs in sequence as you can which gives you more points. You will probably love this game. Unfortunately, I know absolutely nothing about soccer, so the commentary, scoring, bonuses, etc. was all lost on me - lol. Graphics: Good - not stunning. No real backdrops other than the same old green - not even grass. Sound: No real music as I can recall but there was some commentary and the voice was clear, crisp and with a great accent (ladies, gotta love an accent - lol). 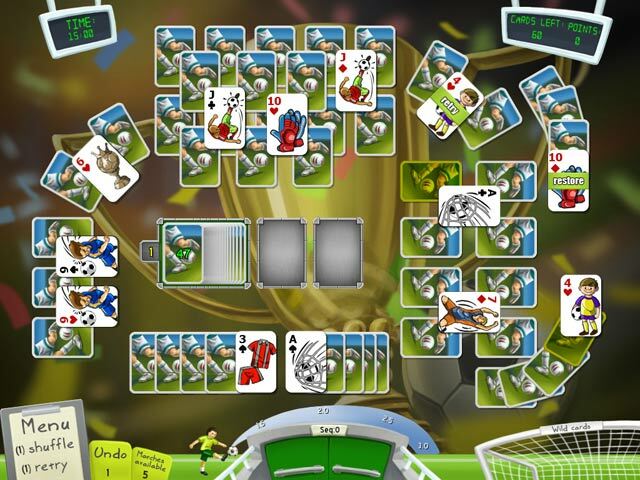 Game Play: This was not your typical type of solitaire game, however, but more of a match game. Match the cards until you can't anymore and have to rely on the "deck'. If you make a "Perfect" - hurray for you. Most times, I found, when my shuffles were gone I had to replay the hand. Now, THAT was my choice. I could also have chosen to move on to the next level but I'm kind of OCD like that. I enjoyed the game play thoroughly; however, I did feel at a disadvantage not knowing soccer terms, etc. Also, what does one do with your points? No store that I could tell. You do accrue wild cards as you play but that was pretty much it. This Glam-ma says definitely give it a try. Especially soccer enthusiasts - I think you'll really enjoy this game. Great for everyone in the family but not a great challenge. The review of this game is this Glam-ma's unbiased opinion of the game - and only mine. Therefore, if you found this review to be helpful, please click on the 'yes" button below. There is also a "no" button. Seriously? You'd give your Glam-ma a "no"? Kidding. Happy Gaming. Well-designed gameplay, cheerful artwork/graphics with a ton of layouts, power-ups, obstacles, plus wildcard spots, giving many ways to get the goals our team needs to win matches. Core gameplay involves filling a score/goal meter by making runs & pairs, etc. When it hits 3500, our team gets a goal. Chains give a big multiplier & levels have no time limits. Luck factor of RL sports is added by occasional mystery cards that set up little mini-games (non-intrusive, brief), e.g., points bonus for a great pass, or worse, fumble & the other team scores. Game's structure follows perfectly the real World Cup soccer match system, a joy! Many customisations possible. Music is real soundtracks & it's wonderful as is Commentator's voice. All can be turned off. Note: *play demo all the way through* because though easy to learn, it can take a bit to catch on to how to make Good Progress. Action ramps up somewhat as matches go forward, yet it's never unfair & we can skip ahead or replay any level. Many features, lively gameplay, unlimited re-playability, I highly recommend the game. SO ADDITIVE ... TIME FLYS... SO MUCH FUN!!!!!! My demo hr. was over quick and I was hooked. Very much like golf solitare. You just have to figure out the game requirements to score the most points while matching your cards. At 4500 pts you score a goalie, and you compete with other Nations. The game is really a Great Game to relax to and still have Great Fun. I Really Love It. A New Fav of mine. Thank You Big Fish!! Oh the best help is the re shuffle. Use when you get stuck. Enjoy. I Highly Recommend. This is a very fun game. It is not like solitaire at all. What you do is to fun two cards that are the same for ex: find to 5;s to 10's to k's etc. It is very relaxing to play. I could play it for hours the only problem is I only get one hr. I would recommend this game for anyone. If you want a game that is fun and relaxing to play this is the game you want. I liked the game and bought it. I know nothing about soccer but it still appealed to me. You pick your team from a list of countries and play them against the rest of the worlds teams to win the World Cup! You match two cards of the same number until they are all gone. It takes many games to win the World cup! The music for this game is the first time I actually listened to the music for awhile, it was very enjoyable. There is a commentator that you can turn off if you want to just relax and enjoy playing. Not very challenging but it is fun to win. There was only one thing that bothered me and that is when I played a mini game it had no button to click when it was over and it would not do it automatically, I finally figured out that you had to hit your escape button on the keyboard to make it go away. A little inconvenient when I usually put my keyboard away in a drawer while playing. They also did not list Panama as one of the Countries you can pick but there are many others from around the world.